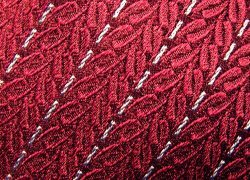 Item description: This beautiful silk tie was manufactured by the Italian house of Ermenegildo Zegna in 2001 for Patek Philippe. Available that year in two colourways, this example is the burgundy version, with a pattern made up of minute floral motifs using darker & lighter burgundy coloured silks, along with diagonal broken light blue lines. 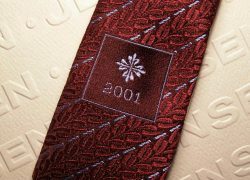 The top end of the tie has a small Patek Philippe Calatrava Cross in light blue threads, along with the date, 2001. The motif and date are within a small dark burgindy box, with a fine light blue edge line. 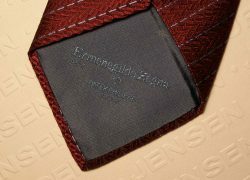 On the reverse of the wide base is a fine grey-blue silk with the woven names, ‘Ermenegildo Zegna pour Patek Philippe Geneve’. Condition report: New old stock. Mint condition. Storage age only. 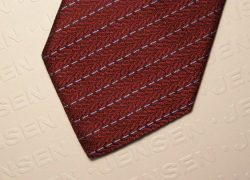 This tie is supplied in a gift box.